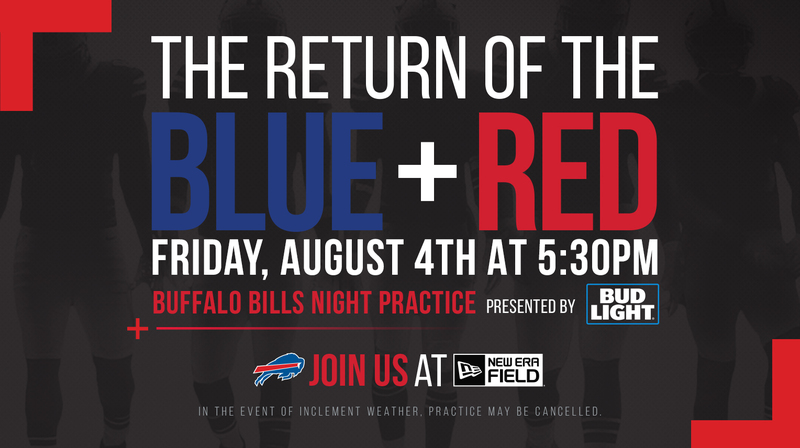 The Bills will be back at New Era Field on Friday, Aug. 4 for ‘The Return of the Blue + Red,’ presented by Bud Light. The event will give fans a live look at Head Coach Sean McDermott’s squad running drills and prepping for the season. The exciting evening will also feature an appearance by Billy Buffalo and an interactive and family-friendly area for fans to enjoy. Located inside the gates near The Bills Store, the space will have football interactives, mini golf, lawn games, a rock wall and much more! Tickets for the event are complimentary and are available for pick up at The Bills Store located at New Era Field from July 28 until Aug. 3 – with a limit of four per person. Starting Aug. 1 the store will be open from 10 a.m. – 9 p.m. Monday through Saturday and 10 a.m. – 3 p.m. on Sunday. A limited number of tickets will also be available through the My One Buffalo mobile app. Check the ‘My Tickets’ section in the app for more details. Gates open at 4:30 p.m. and parking is free. We’re looking forward to seeing you there, Bills fans!